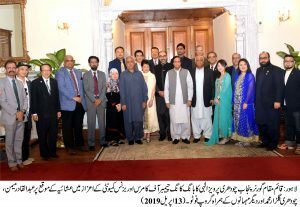 Lahore: 13-04-2019: Acting Governor Punjab Ch Parvez Elahi has said that Prime Minister Imran Khan is working hard day and night with good intention for bringing foreign investment in the country. Speaking at a dinner hosted in honour of Hong Kong Chamber of Commerce and business community at the Governor’s House here, Ch Parvez Elahi said that conducive suitable atmosphere is being provided to the foreign investors and vast opportunities exist by formulating effective policies. Hong Kong delegation included Consul General Pakistan Abdul Qadir Memon, Chairman Pakistan Chamber of Commerce Hong Kong Ch Gulzar Muhammad, Behzad Mirza, Chairman, Asia & Africa Committee, Hong Kong General Chamber of Commerce, Mr Lau Yuet Yung Ellen, Director, Cable Consultant Ltd., Vice President, Pakistan Chamber of Commerce Hong Kong, Mr Tang Kam Tin, Chairman, Chinese Manufactures Association, Hong Kong, Ms Sabina Wong, Director, Masyi Technologies Sdn Bhd, Mr Lawrence Yueng, Production Director, Circle Creation Hong Kong, Ms Winnie Yueng, Director, Circle Creation Hong Kong, Ms Ho Yuk Bing Barbara, Director, AJ’s International Ltd, Mr Richard Cheng Tung, DMD, Corporate Management at HNA Group International Company Ltd, Mr Chan Pak Nin, Director, J R Consulting HK Ltd., Mr Javed Chattha, Mr Sandy Cheng, M D, Global Cargo (far East) Ltd., Mr M M Khan, SSP Hong Kong Police Rtd, Consultant Hong Kong China Trade, Yu Sau Ming Homer, Coordinator, EuroAsia one Belt One Road Centre, Mr Joellen Chan, Live ABC Interactive Corporation (Taiwan), Ms Chien Wai Miao, Live ABC Interactive Corporation (Taiwan), Rai Muhammad Riaz, Director, Advance General Group HK Ltd., Mr Ghulam Mustafa, M D, GM Enterprises Ltd., Syed Amir Masood Bukhari, Director, NTS Life Company, Mr Khalid Rehman, Alice Lin, Pak China Cooperation Forum, Muhammad Irfan, MD Twin Trading Ltd., Mr. Ali Awan, Trade Development Officer, Consulate General of Pakistan, Hong Kong.